Includes one or more module positions in Community Builder profile. By this plugin you can publish module in Community Builder profile, inside a tab. Would you publish a menu module, a custom html module, would you publish latest visits module in CB? 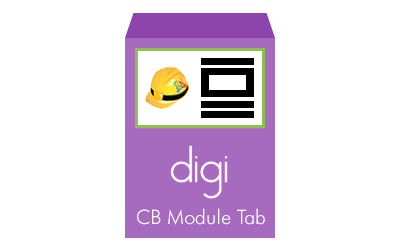 With Digi CB Module Tab you can include up to six different module positions in a tab. Layout is Bootstrap based (two rows and three columns). Set the names of module positions where you want to place a module in Community Builder, and if needed, enter the custom CSS code directly in the plugin, to set the Joomla module in CB. The plugin is mobile-friendly because it uses Bootstrap for module positions layout. In desktop mode, modules are arranged in two rows and three collassable columns, in mobile mode, modules are arranged in only one column. This Community Builder plugin is very useful to publish a module in Community Builder profile, inside a tab, for example a Joomla menu module or to include custom html code in CB profile. Below is represented the layout of module positions. Each position can be named with as you prefer, then you have to publish the module in that position, for example if you name the first position "cb-module-tab-1" then publish the module in "cb-module-tab-1"; do this for all positions you want to use. This plugin allows you to get up to six module positions inside CB profile. Can I publish only one module? Of course yes, you can choose to publish up to six modules in six positions, all inside a tab in CB profile. How modules are arranged in the tab? All the six positions are arranged in two rows and three columns. Columns are collassable, so if you don't want to use all module positions, you will not have empty white spaces in CB profile.